We’d love your help. Let us know what’s wrong with this preview of Have Bags, Will Travel by D.G. Kaye. D.G. Kaye is back, and as she reflects on some of her more memorable vacations and travel snags, she finds herself constantly struggling to keep one step ahead of the ever-changing guidelines of the airlines-with her overweight luggage in tow. Her stories alert us to some of the pitfalls of being an obsessive shopper, especially when it comes time for D.G. to bring her tre D.G. Kaye is back, and as she reflects on some of her more memorable vacations and travel snags, she finds herself constantly struggling to keep one step ahead of the ever-changing guidelines of the airlines-with her overweight luggage in tow. Her stories alert us to some of the pitfalls of being an obsessive shopper, especially when it comes time for D.G. to bring her treasures home, and remind us of the simpler days when traveling was a breeze. To ask other readers questions about Have Bags, Will Travel, please sign up. This amusing memoir by D.G. Kaye is all about the difficulties faced by a shopaholic whose idea of travel centers largely around shopping and getting all her fantastic purchases home without paying excess baggage costs. I could relate to this book really well because I am both of the things the author is; I am a germ fanatic and I love to shop. My shopping also comprises of bulky objects because I collect antique and vintage dolls and books. Have you ever tried to pack three teddy bears, two por This amusing memoir by D.G. Kaye is all about the difficulties faced by a shopaholic whose idea of travel centers largely around shopping and getting all her fantastic purchases home without paying excess baggage costs. I could relate to this book really well because I am both of the things the author is; I am a germ fanatic and I love to shop. My shopping also comprises of bulky objects because I collect antique and vintage dolls and books. Have you ever tried to pack three teddy bears, two porcelain dolls, gifts for everyone you know and about twenty vintage books into your return suitcase without it being overweight? I have so I can relate to D.G. Kaye's weakness for shoes and having to get them back home. Have you ever read a book that could have been written about you? D.G. Kaye did just that. Case#1 – She’s a shopaholic. Well, I love to shop, though maybe not as much as she does. Christmas shopping, back to school shopping, birthdays, anniversaries – I could shop for days on end. I love buying gifts for others, furniture for our home, the list is endless. The author loves to buy so much more, in fact shoes are her favorite shopping item. The problem is she shops when she travels and has to have Have you ever read a book that could have been written about you? D.G. Kaye did just that. Case#1 – She’s a shopaholic. Well, I love to shop, though maybe not as much as she does. Christmas shopping, back to school shopping, birthdays, anniversaries – I could shop for days on end. I love buying gifts for others, furniture for our home, the list is endless. The author loves to buy so much more, in fact shoes are her favorite shopping item. The problem is she shops when she travels and has to have a way to get it home without customs finding out she packed more than she is allowed to bring back. As you will see, she goes to great lengths to pack creatively. Case #2 – the suitcase. My husband thinks my suitcases are overloaded, but I never have to pay for overweight luggage or an extra suitcase. I have a few packing tricks up my sleeve to get everything to and from with some room to spare for purchases. Ms Kaye, on the other hand, has tricks galore. Her friends personalities are much like the author's, and their escapades will leave you chuckling. Well, not exactly. They will have you in stitches. Follow D.G. Kaye as she travels to Paris, London, Las Vegas, Greece, Venezuela, and Arizona. You will be fascinated with her description of the transition from old Vegas to the Vegas we know today. I’m not about to go into detail about her shopping trips, the size of her suitcase, or how she manages, or not, to get through customs. You have to read the book to find out. However, I promise, you will be laughing from page one to the end. Written with such vivid detail, you will feel you are right there watching the spectacle of someone who loves to shop too much, trying to get everything home without chucking it on the way to airport. A delightful story, HAVE BAGS, WILL TRAVEL, is a short book that can be read in one sitting. Do I recommend HAVE BAGS, WILL TRAVEL? Absolutely! 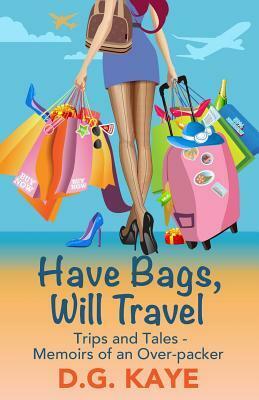 Have Bags, Will Travel is a humorous memoir written by the transcendent shopper and traveler, Canadian author, D.G. Kaye. Be prepared for hilarity as she relates her travails with customs agents and international flights, while she bemoans the capacity limits of her baggage. Her love of shopping is a recurring theme in her writing resulting in some of the funniest pieces in the book. Imagine you and your best friend traipsing all over Paris, literally wearing holes in the soles of your shoes whi Have Bags, Will Travel is a humorous memoir written by the transcendent shopper and traveler, Canadian author, D.G. Kaye. Be prepared for hilarity as she relates her travails with customs agents and international flights, while she bemoans the capacity limits of her baggage. What I love about this novella-length book beside the fact that it’s a fast, entertaining read, is Kaye’s hilarious look inward at herself and her serious addiction to shopping. Her book reads like a series of fun blog posts, highlighting her signature, conversational style, while sharing useful travel information! A seasoned traveler (well, except the over-packing part—but life is short, right? ), Kaye deftly reminisces her early days of travel when life was simple and “travel was a joy.” (Before What I love about this novella-length book beside the fact that it’s a fast, entertaining read, is Kaye’s hilarious look inward at herself and her serious addiction to shopping. Her book reads like a series of fun blog posts, highlighting her signature, conversational style, while sharing useful travel information! A seasoned traveler (well, except the over-packing part—but life is short, right? ), Kaye deftly reminisces her early days of travel when life was simple and “travel was a joy.” (Before TSAs!). She then describes how her obsessive shopping habit has created the need for smart packing and planning. With everything she has purchased over the years, one would guess she has an extra house for all her goodies! Kaye’s love for travel and adventure is evident as she shares hilarious exploits and nail-biting moments on her many trips that include London, Paris, Venezuela, the Greek Islands, and on to Las Vegas and Arizona. Kaye shares valuable advice for navigating airport security, planning for purchases and dealing with germs. Her idea of packing sockettes in her purse to wear through the TSA line after removing her shoes is brilliant. Kaye’s chapter “Admitted Germ Freak” resonates with all of us as we hear more and more of the dirt, grime and germs associated with hotel rooms, public restrooms, and restaurants. Be prepared to have your heart chuckling and your lips smiling as you read through D.G. Kaye’s delightful travel adventures. Although the main theme of the book is on her affection for shopping it’s also a memoir like no other as she holds your hand and guides you through her trips to Paris, London, Greece, Venezuela and Vegas. You meet her friends who are almost as zany as she is while she ponders on the good old days of travelling and her sadness to see the old charm of her beloved Vegas fade Be prepared to have your heart chuckling and your lips smiling as you read through D.G. Kaye’s delightful travel adventures. Although the main theme of the book is on her affection for shopping it’s also a memoir like no other as she holds your hand and guides you through her trips to Paris, London, Greece, Venezuela and Vegas. You meet her friends who are almost as zany as she is while she ponders on the good old days of travelling and her sadness to see the old charm of her beloved Vegas fade away. Oh, but the girl can get into trouble, especially when it comes to exceeding the airline’s weight limits on luggage. For those of you who are familiar with D.G. you will recognize her quirky sense of humor and her authentic voice in this travelogue. It’s refreshing and relaxing. I dare anyone to read it and not laugh at how she gets out of her cross border shopping dilemmas. Therapeutic for travellers as it shows you it could be worse! Although I’ve been travelling more than I used to in recent years, mostly for family reasons, I cannot say I’m a seasoned traveller or one who knows all the tricks of the trade. I get annoyed by the queues at the airport, like most of us, and I always discover I’ve left something in my hand luggage that shouldn’t be there, even after checking. Reading this book I realised that perhaps I shouldn’t complain. I am not obsessed with germs Therapeutic for travellers as it shows you it could be worse! Although I’ve been travelling more than I used to in recent years, mostly for family reasons, I cannot say I’m a seasoned traveller or one who knows all the tricks of the trade. I get annoyed by the queues at the airport, like most of us, and I always discover I’ve left something in my hand luggage that shouldn’t be there, even after checking. G. is a woman with a great sense of humour and writes the book as if she were sharing anecdotes around a table with some friends. She wonders why she always gets picked up for searching at the airport (she tries to go unnoticed but there are limits to her attempts at invisibility) and is happy to confess to her fears, her crazy shopping sprees, and her failed best-laid plans. I was particularly interested in her reflection about how Las Vegas had changed. She describes her first trip there as a fascinating experience, when you landed in the desert and the hotels were the only oases in it and is disappointed by how much it has changed. I’ve only visited once and not being a gambler either, found that although its location was very convenient, it wasn’t the place I had read about. It’s difficult to fight commercialisation and consumerism and nobody can stop “progress” but perhaps there’s more to be lost than to be gained by some of the changes we’re implementing. The opening sections had me nodding my head and smiling. Germs. While I’m not as obsessive about them as D. G. Kaye, I am a faithful hand-washer. Years ago, I began using my shirt, jacket or the paper towel I dried my hands with to open public washroom doors. I thought I was the only one who did this until I read Johnny Depp also did. And now I read Kaye does the same. Kaye explains how air travel has changed over the years with new regulations, restrictions and lack of comfort. It’s not for the The opening sections had me nodding my head and smiling. Germs. While I’m not as obsessive about them as D. G. Kaye, I am a faithful hand-washer. Years ago, I began using my shirt, jacket or the paper towel I dried my hands with to open public washroom doors. I thought I was the only one who did this until I read Johnny Depp also did. And now I read Kaye does the same. Kaye explains how air travel has changed over the years with new regulations, restrictions and lack of comfort. It’s not for the better but if you’re like Kaye, you keep travelling and apply humour to the wounds. My travel doesn’t always involve planes, but I have noticed many things have changed over the years. The biggest being security. Before 9/11, a week-trip to Montreal for a hockey game and shopping found my brother and I the only ones on the plane after the stop-over in Moncton, NB. Once in the air, the steward asked if either of us wanted to go into the cockpit. I jumped at the chance. While my brother and the steward broke out the liquor, I sat between the pilot and co-pilot all the way home, including for the landing. It was a thrill I’ll remember always. It was Christmas Eve and they were talking about sightings of Santa Claus and joking about who could land the plane better. Sadly, this would never happen these days. Kaye shares many travelling adventures she has had with friends and family over the years, and although they don’t all include shopping, many of them do. For Kaye, shopping is a sport. Her perspective on how the atmosphere and landscape has changed in Las Vegas, Nevada, is interesting because she has been visiting her beloved Vegas since she was twenty. I’ll admit I do not like to shop—buying only a few items when I travel—and I pack lightly—taking only what will fit into a backpack and the shoes on my feet—but anyone who finds themselves struggling with luggage weight restrictions and too many things to fit into their baggage for the return trip, will find a few great tips and lots of humour. In reviewing Have Bags, Will Travel I must first confess that I have never been a woman, at least in this lifetime. That, not to put to0 much of a sexist spin on it, means I don’t have the shopping gene. Still, having watched countless movies and TV shows over a lifetime—and read a few books as well, I am familiar with the whole shopping zeitgeist. Then too, I have had the experience of traveling hither and yon. Not having the shopping gene has saved me from some of the travel travails that D.G. In reviewing Have Bags, Will Travel I must first confess that I have never been a woman, at least in this lifetime. That, not to put to0 much of a sexist spin on it, means I don’t have the shopping gene. Still, having watched countless movies and TV shows over a lifetime—and read a few books as well, I am familiar with the whole shopping zeitgeist. Then too, I have had the experience of traveling hither and yon. Not having the shopping gene has saved me from some of the travel travails that D.G. Kaye humorously recounts. The need for a travel scale to weigh suitcases. Customs enforcers frequently finding fault, or at least doubt, with her attention to limits on the value of goods brought into the country. Whether you’re a shopper or not, there’s no doubt that flying is not as much fun as it once might have been for many. The seats get smaller, the aisles narrower, the allowable luggage more compact and of course the security checks have become over the top. Ms Kaye covers it all in a breezy book, reminiscing on her adventures around the globe with friends and fellow shoppers. It’s a fast and funny read. For me, the answer to that question is- just about everything is more exciting and pleasurable to me than traveling. However, I love to read travel memoirs and this is good one! Germs, shoes, luggage weights, a Red Head and a Blonde in Paris, plus lots of other topics covered in this series of hilarious snippets from the travelling life of the author. After years of working in the travel industry I can only second many of Kaye's pointed observations and comic descriptions of travels past and present. Much of what we endure to travel these days seems to defy logic and Kaye has a qitty way of putting things as well as a sharp, observing mind. There are many hilarious moments as the author is stuck in customs at an airport in Venezuela, Canada or out in London and the Champs Elysee. Very enjoyable, pretty accurate and useful, thanks to the many After years of working in the travel industry I can only second many of Kaye's pointed observations and comic descriptions of travels past and present. Much of what we endure to travel these days seems to defy logic and Kaye has a qitty way of putting things as well as a sharp, observing mind. There are many hilarious moments as the author is stuck in customs at an airport in Venezuela, Canada or out in London and the Champs Elysee. Very enjoyable, pretty accurate and useful, thanks to the many tips at the end of the book. As it happens, I read this in an airplane, so I had to chuckle at the many similarities between my reality and Kaye's pointed remarks. To me, reading it was the equivalent of eavesdropping into a girls' night, listening to their stories and hearing them laugh at silly things they've done. All this in a warm and smiling context that doesn't take itself too seriously. This is a light easy read with some nice cameos about the places Kaye has travelled. Well, actually, the cameos are more about the places Kaye has bought shoes from and tried to avoid paying excess baggage and/or duty when she returns home to Canada. I liked the nostalgia for when travel by air was so much easier. Reminded me of a flight from India to Thailand when you could easily grab five middle seats to yourself and have a good night’s sleep. Kaye makes some pertinent and salient points about t This is a light easy read with some nice cameos about the places Kaye has travelled. Kaye makes some pertinent and salient points about the changes in air travel: restrictions on personal items, lower and lower baggage allowances, taking off shoes and standing where thousands of unwashed feet have stood before, endless doses of radiation, and of course, the cramped seating in cattle class. The book is really a series of anecdotes about shopping trips with Kaye’s friends – who, luckily, all seem to like shopping too – rather than one about travel. As someone whose idea of travel is a rucksack, T-shirt, jeans and trainers/walking boots, the idea of taking one large suitcase, let alone two or three, makes me feel dizzy. If you're team 'never travel light' you'll find a lot of comfort in this book. This shopaholic author chats away about her travel traumas, random experiences and funny thoughts; it’s as though she’s sitting with you in your living room ha This might have been one of the shortest books I’ve read in a while, with some of the chapters being only two pages long, in fact I was really disappointed when I saw how thin it was, but as they say – size isn’t everything, and it was way better than I expected. I laughed out loud at many of the author’s experiences of the perils of traveling. Going through security and customs. Aisles too narrow to avoid smacking seated passengers in the face with your carry-on. Her hilarious airplane bathroom “ritual”, which is something a lot of us perform. (Or perhaps it’s just me.) Which brings me to the section on germs. I laughed as much over Kaye’s descriptions as I did over the memory of doing many of these same things. I love her decision to call germaphobic c I laughed out loud at many of the author’s experiences of the perils of traveling. Going through security and customs. Aisles too narrow to avoid smacking seated passengers in the face with your carry-on. Her hilarious airplane bathroom “ritual”, which is something a lot of us perform. (Or perhaps it’s just me.) Which brings me to the section on germs. I laughed as much over Kaye’s descriptions as I did over the memory of doing many of these same things. I love her decision to call germaphobic compulsions “a lifestyle as opposed to a disorder”. The latter half of the book is filled with anecdotes of trips taken and shopping done. While I’m not a shopaholic (actually, I avoid going to stores), I still got a chuckle out of the author’s antics. And I can relate to the lure of vacation shopping—it’s a powerful force. Unfortunately, I can also relate to being the one passenger consistently being pulled over at customs. Every time. Everywhere I go. It’s become part of my traveling routine and a joke in my family. The chatty and conversational writing style makes this a fun read. If you’re taking a trip, make room in your carry-on for this. I enjoyed this book and can relate to some of the issues. I have never been an over-packer of this magnitude as I always ensure I can comfortably carry my own luggage. I do like to shop and understand the difficulties this can create. I liked the personal stories and laughed along with the author. I've never been to many of the places she has written about so I enjoyed her descriptions. A good easy read. This is a delightful book is all about travelling! The author writes with a deft quick-witted skill of her numerous adventures and misadventures whilst travelling with many problems involving her purchases abroad and trying to return them home. Her powers of persuasion should have landed her a job on the diplomatic crop! Within the light-hearted elements, there are however profound and moving snippets from her various trips, I particularly enjoyed learning how Las Vegas, a popular destination for This is a delightful book is all about travelling! When Kaye isn't writing intimate memoirs, she'll bring her natural sense of humor into her other works. Her Favourite Saying: "Live. Laugh. Love …and don’t forget to breathe!" is her website logo, to remind herself and others that we often forget to take a pause.